Libraries and Risk; Disaster preparedness; Operational resumption, continuity, and recovery; Damage assessment and strategic alliances; Disaster declaration and crisis management; Clean-up, who, when and how; Post-disaster management of patrons; Normalization of operations; Staff orientation and training; Testing, auditing, updating disaster plans; The in-house planning champion; Pandemic management in libraries; Moisture control vendors and their services; Library security and loss control. Libraries are constantly at risk. Every day, many libraries and their collections are damaged by fire, flooding, high winds, power outages, and criminal behaviour. Every library needs a plan to protect its staff, sites and collections, including yours. 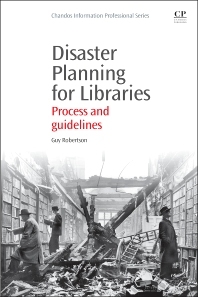 Disaster Planning for Libraries provides a practical guide to developing a comprehensive plan for any library. Twelve chapters cover essential areas of plan development; these include an overview of the risks faced by libraries, disaster preparedness and responding to disasters, resuming operations after a disaster and assessing damage, declaring disaster and managing a crisis, cleaning up and management after a disaster and normalizing relations, staff training, testing disaster plans, and the in-house planning champion. Librarians, Library administrators, Records managers, Information professionals and other specialists in the information sector. Guy Robertson is adjunct professor at the University of British Columbia, a senior instructor at Langara College, and an instructor at the Justice Institute of British Columbia, Canada. Guy is noted for his research into book and manuscript theft, data loss and protection, and financial fraud and forgery. He has delivered keynote speeches, seminars, and workshops at conferences and has published widely on risk.